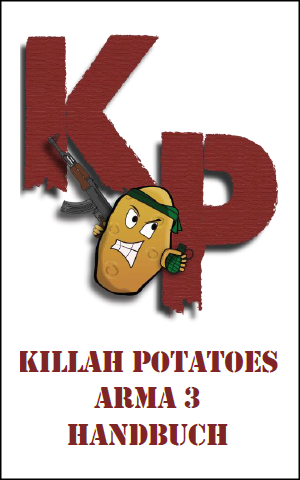 For the Killah Potatoes Gaming Community, ArmA 3 is a simulation and absolutely not a First Person Shooter like the Battlefield or Call of Duty series. Therefore we try to create and provide a highly realistic but also fun gaming experience for our members and players. In order to achieve that goal there has to be an organised framework that groups our players into an effective Unit within the ArmA 3 world. So we have decided to allocate our troops into platoons, sections and squads. This helps to achieve a more realistic and well functioning structure, especially alongside the ACRE 2 Mod. Moreover, that system allows our members to play just as they wish to. This means that players with more experience and motivation can lead small squads on their own in our ArmA 3 sessions and also means a lot of responsiblility for each soldier in their team and within the mission itself. Nevertheless there are places for players to take action as "normal" soldiers, those who would like to play a casual round while receiving orders by their superior without having organisational tasks or issues with the long range radios and thus the section leaders. We decided to have our own ranking system and implemented that with a modified mod into the game, with that system we want to come closer to our goal to make the game experience and immersion as realistic as possible. This helps new players to see who has what kind of "experience level" and who to ask questions about the game. A squad leader with the rank of a Corporal is probably more able to help than a Private First Class, who maybe struggles with mods and the game himself. Due to feedback from our regular players this rank system creates not only an organisational aspect but also a motivation to keep on playing, or aim higher in rank. We absolutely don´t tolerate discrimination or open conclusions about ones skills, according to their rank. Once again, the ranking system is just an indicational aspect about the playtime and even the responsibility of a player within our troop-organisation and NOT a measurement for gaming or social skills. We are playing ArmA 3 in a cooperative way together, no matter the different rankings. Are you interested in playing ArmA 3 with us we suggest taking a look at our PDF field manual.